Picture - Cockle on the River Medway, Rochester in 1924 - original fin. 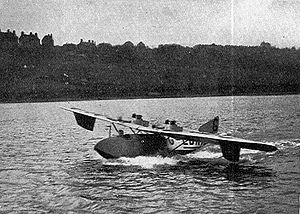 The Short S.1 Cockle was a single seat sport monoplane flying boat, with a novel monocoque duralumin hull. It was underpowered and so did not leave the water easily, but it proved that watertight and corrosion resistant hulls could be built from metal. From about 1921 Oswald Short had been thinking about the construction of seaplane floats and flying boat hulls made from metal, specifically duralumin, rather than the traditional wood. The latter always suffered from water retention and did not last well in the tropics. He assembled a team, including C. P. T. Liscomb who had extensive experience with that alloy to look into the hydrodynamics and corrosion characteristics of such hulls, and by 1924 was looking out for an opportunity to apply their results. It came with an Australian order for an aircraft suitable for fishing trips around Botany Bay, which Short proposed should be a small flying boat. It was named the Stellite and was the first aircraft to have Short's new design index number, S.1 When it was built and registered as G-EBKA the Air Ministry objected to the name on the reasonable grounds that the Short Stellite might well be confused with the Short Satellite, built at much the same time; it was therefore re-named the Short S.1 Cockle. It was the smallest flying boat ever built at that time. 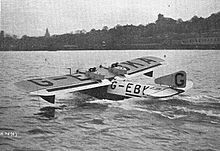 A contemporary source claimed it as "the first light seaplane to be built [in the United Kingdom] and possibly in the world" and the first British all-metal flying boat. The Cockle was an all metal aircraft apart from the fabric covered flying surfaces. The hull was a duralumin monocoque structure with a concave V-shaped planing bottom incorporating two steps, the main one near the centre of gravity. These steps were external to the monocoque to prevent step damage leading to water leakage into the hull. The top of the hull was rounded, with a single seat open cockpit near the nose. The wings had steel spars and were mounted on the top of the fuselage, with pairs of bracing struts to the chines. The wings carried full span ailerons which could be drooped together, flap-like, for landing. There were stabilising floats near the wing tips in trouser like fairings. The two engines were mounted on top of the wing at about mid-chord, the twin bladed propellers being driven via long extension shafts to the leading edge. Originally the Cockle had a shallow triangular fin and rudder, but this was later extended upwards to a curved and slightly pointed profile which more than doubled the area, to cope better with single-engine flying. A tube ran transversely across the hull just above the main step, into which the axle of a pair of ground-handling wheels could be inserted. Deterred from using 32 hp (24 kW) Bristol Cherub flat twin engines by vibration problems, the Cockle began life with a pair of Vee-twin Blackburne Tomtits. Ungeared and so limited to the maximum 2,400 rpm of the propellers, the Tomtits could only produce 16 hp (12 kW). It is not surprising that, when it came to the first flight the Cockle was underpowered. Before the aircraft was complete the bare hull (always Short's main concern) was floated for a day in April 1924 and found to be satisfactorily watertight. Attempts to get it off the water began in September, but it did not succeed until 7 November 1924, with its wing at a higher angle of incidence and its pilot lightly dressed. It has been suggested that it only flew because the atmospheric pressure was exceptionally high that day.